And more — I am not the Expert — Consult with a Professional! Renovating, remodeling and living in our midcentury and vintage homes can be gratifying, but please always remember, there can be safety and environmental hazards in the surfaces, layers, materials and products in our homes. Anything old, even New Old Stock, that you buy also may have issues. 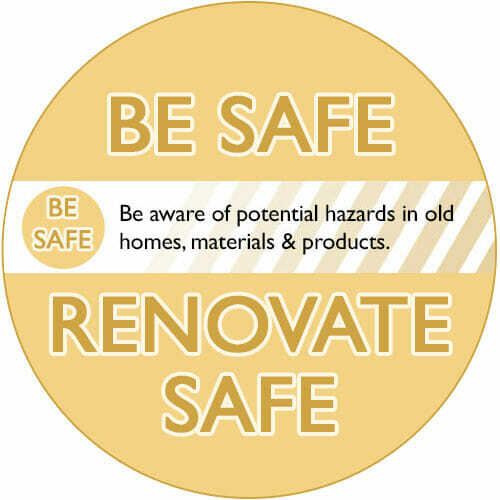 We all care very much about managing safety and environmental issues properly, so when moving into a home … when undertaking cleaning, repair, remodeling or restoration projects … or when adding old materials (salvaged, used, new old stock, etc. )… be sure to get with your own properly licensed professionals to determine what you are dealing with/working with so that you can make informed decisions how to handle, become familiar with and use recommended best practices, and also learn about the proper disposal of debris, etc. Lead may be found in all kinds of locations: in paints on windows, trim, walls, cabinetry, furniture and decorative items of all kinds … in dirt outside … in plumbing/pipes and faucets/fixtures … in ceramic tiles… on enameled sinks and bathtubs… on dinnerware and drinkware … in varnishes on flooring and elsewhere … in vinyl mini-blinds … in lead crystal drinkware … in old linoleum … on old Christmas ornaments… and potentially more places — do your own research. A few governmental and industry sites with research — but please do your own/get with your own experts — include:. Asbestos may be found in all kinds of locations: in attic and wall insulation and in other insulation products [wrapping pipes, in attics, in stoves, in lighting, etc.] … in textured paint and patching compounds used on wall and ceilings… in vinyl floor tiles and the backing on vinyl sheet flooring and adhesives … in adhesives / mastics / mortars … in roofing, siding and shingles … in heat-resistant fabrics … even in Christmas tree and wreath flocking and fake “snow”… and potentially more places — do your own research. One governmental site with research — but please do your own/get with your own experts:.Textured paint and patching compounds used on wall and ceilings. EPA hosts a website on asbestos in the home. Any number of building code issues not in place when your house was built. … and… more …. ? Again: GET AND CONSULT WITH YOUR OWN PROPERLY LICENSED PROFESSIONALS to assess the materials in your house so that you can make informed decisions.